World’s most efficient single-aisle commercial jet Embraer’s E190-E2 lands at Dhaka Hazrat Shahjalal International Airport. As part of its tour around the region, World’s most efficient single aisle commercial jet Embraer’s E190-E2 arrived at Hazrat Shahjalal International Airport here on Thursday morning.The test flight arrived here around 12:31 after flying from Indira Gandhi Int’l Airport in New Delhi, India for flying around one hour and 37 minutes, according to the flight chart. 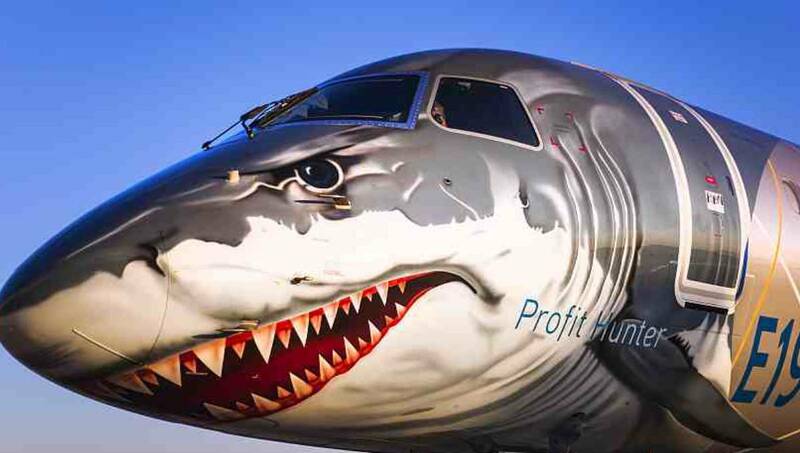 Sporting a shark livery to represent the aircraft’s ‘profit hunter’ status, the aircraft will offer Embraer’s guests a closer look at the world’s quietest, cleanest and most efficient new-generation single-aisle aircraft.“We are proud to bring this aircraft to the region for the second time to show the amazing capabilities of the E190-E2,” said Cesar Pereira, Asia Pacific Vice President, Embraer Commercial Aviation. Flight test results also confirmed the E190-E2 to be better than its original specification in takeoff performance in hot-and-high conditions as well as short field takeoff.E190-E2 also becomes the aircraft with the longest maintenance intervals in the single aisle market with 10,000 flight hours for basic checks and no calendar limit in typical E-Jets utilization. This means additional 15 days of aircraft utilization in a period of ten years compared to the first-generation E-Jets. Since it was founded in 1969, Embraer has delivered more than 8,000 aircraft. About every 10 seconds an aircraft manufactured by Embraer takes off somewhere in the world, transporting over 145 million passengers a year.Embraer is the leading manufacturer of commercial jets up to 150 seats. The company maintains industrial units, offices, service and parts distribution centers, among other activities, across the Americas, Africa, Asia and Europe.